Chris Hein Horns Vol. 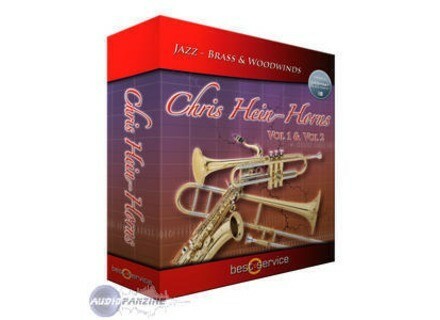 1.5 - Solo Instruments, Wind instruments ensemble from Best Service in the Chris Hein series. 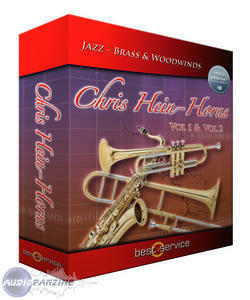 Best Service products announced that the Chris Hein Horns Vol. 1.5 Solo Instruments collection is now a reality. Based on the NI Kontakt Player 2, the collection delivers a strong creative package of four solo instruments — Alto-Sax, Tenor-Sax, Trumpet, Trombone and an additional Trumpet-Section. This collection features nearly 18,000 samples totaling 2.8 gigabytes. At approximately 4,000 samples per instrument, the composer and performer now have the ability to sculpt the emotional content of a recording through the employment of up to 38 different playing techniques, all within one program. Performance nuance is further enhanced by up to 20 velocities per note combined with a choice of up to 189 variations per note, yielding an enormous range of tone and inflection. Seventy-two control features are available with a new interface with 11 edit-pages and six DSP EFX and 21 high-class convolution reverb programs. New control features include Key-Switch Present, Hot-Keys, Key-Vibrato and Real-Vibrato, Legato- and Glide-Mode, Growl-Control, Air-Control, Keys-Control, Spit-Control, Dirty-Notes, Breath Release-Trigger, and more. For more information, visit their web site at www.soundsonline.com. Cluster Sound Minus Clockwork Cluster Sound launches Minus Clockwork, a minimal DJ library available for download: 820 Mb of concrete machine sounds, vocodized and granular beats, glitch patterns, warm low frequencies, voice loops, synth & bass instruments. Creative Labs X-Fi Creative launch their latest sound card, the Sound Blaster X-Fi® Notebook, supposed to improve rendition of compressed audio, films and game sounds on laptops.